I created a unique design that boost signups for EverWeb (a Mac website building app). EverWeb is a "drag and drop" website builder for Mac users that is used to easily create a website without any coding or technical skills. The target audience for this product is older Mac users who are not very computer savvy. Many of the client's users are small business owners, religious institutions, artists, photographers, and hobbyists. The client wanted to implement a modern, elegant design that gives the options to download a free version of their software or make a purchase. They also needed to highlight what EverWeb is capable of without overwhelming the visitor with too much information. They prefer lighter colors that match the existing color scheme of the logo. Compared to its competitors, Everweb has an obsolete website design and a weak content structure. However, it offers the best price on the market for hosting options and 24/7 phone/email support. By highlighting those advantages and using a strong, modern website design Everweb can easily become seen as the hands-down best option for its target audience (seniors) as well as other groups of users. • Use a minimum of 14pt for font size. Use boldface to emphasize content, and avoid using italic. Avoid long blocks of text by breaking copy into chunks wherever possible. 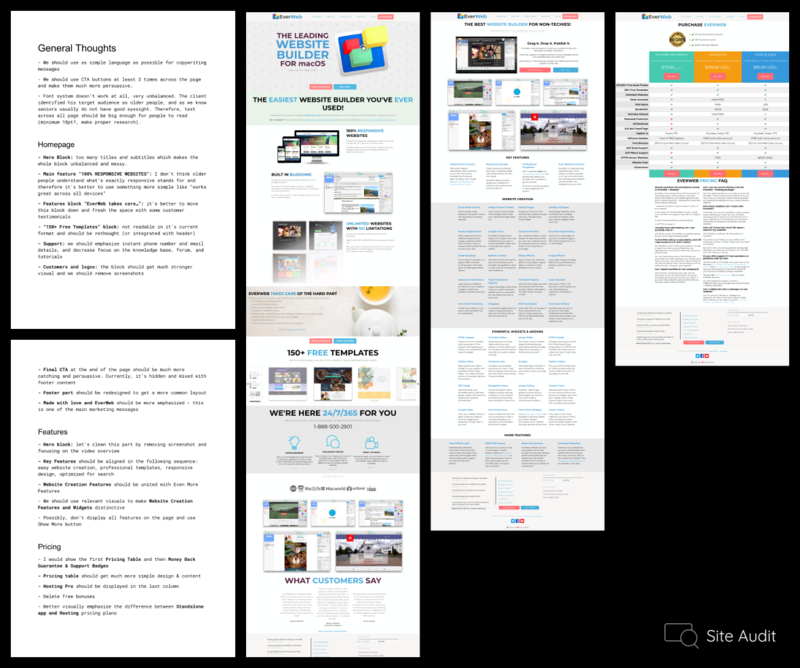 After analyzing all of the data from the UX research, I created a list of relevant visual themes and effective copy guidelines for the new website. This will facilitate writing a new content structure and designing lo-fi wireframes. To avoid overwhelming the user with the number of EverWeb features, only a fraction of them are presented on the main page, and the See More buttons can be used should the user be interested in exploring further. In order to help the user purchase the right version of EverWeb, the Standalone and EverWeb+ Hosting options are visually separated. Hosting Light is also emphasized as the best value purchase since it's a very competitive deal compared to the other existing options in this market. 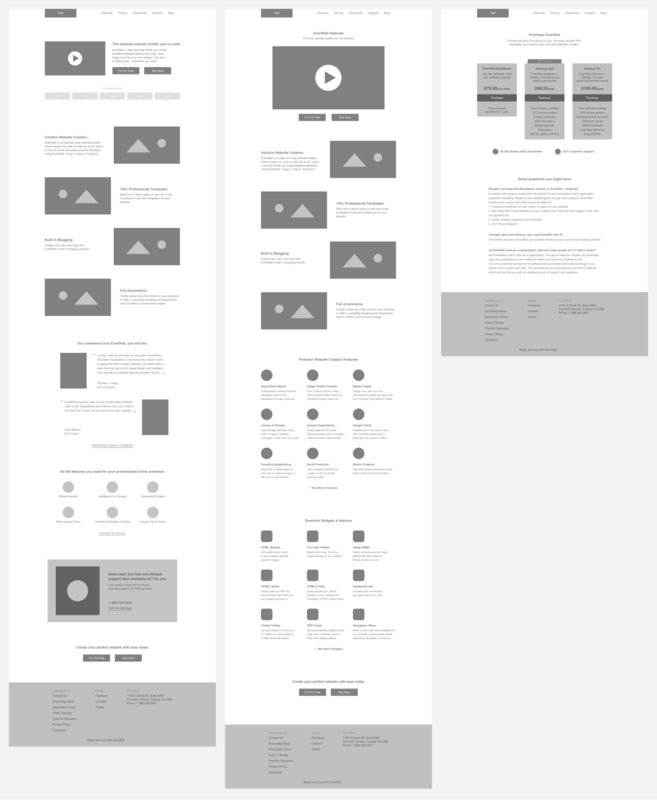 When creating UI always ask yourself, "Am I taking the right visual direction based on all information I know about the project?" and, "Will the style satisfy client's requirements and engage the target audience effectively?". When working on the EverWeb homepage redesign I came up with a nice retro design at first. It synergized perfectly with client's branding, but I kept asking myself "Will this really make an impact on client's business or am I doing this just because I like it?". Because of those doubts, I tried another approach and came up with a new style that will be even more effective. It still complements EverWeb's branding while giving the website a highly desired, modern look.